One thing that I noticed is that I didn't make any mention on the background to the Staedel in my previous post, except in mentioning that it was established by a banker. As it turned out he died without leaving any heirs, that is if you don't consider this museum as an heir. When he died he left five hundred works of art, mostly Flemish and Dutch works, for the public to enjoy, initially in his house but later in a much larger building. Unfortunately, a lot of those original paintings were sold off during the nineteenth century, but since that time a lot more have been collected. The original composition was mostly landscapes, but then again that can be quite a broad term. The original layout was the St Petersberg model, after the Hermitage in St Petersburg (a museum I would love to visit one day). Unlike modern galleries, paintings were kept together and there wasn't anywhere near as much space as you have in modern galleries. 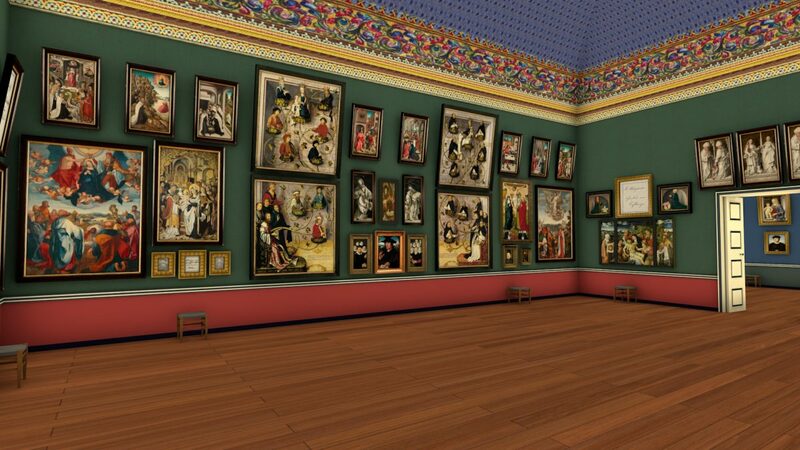 Also, paintings were arranged thematically, and if the paintings were of a similar type they would be grouped together, which suggest that there was probably an entire room dedicated to Madonna and Childs. While I didn't actually find this exhibition until sometime after I had been wandering through the gallery, it is probably worth noting at the beginning of this post considering that it is a temporary exhibition. The thing with Baselitz is that he is a contemporary have been to some exhibitions of contemporary art where you are allowed to take photographs). In fact Baselitz is still alive, which adds further complications to this. In a way his works are similar to Picasso's in that many of them are still under copyright, which is not surprising since, as I have previously mentioned, he is still alive. The exhibition focused on a series of his paintings which he has called his hero paintings. Basically these are paintings of people, but not in the sense that I would refer to them as portraits, namely because in my mind a portrait is a painting of a living (for formerly living) person - Baselitz's paintings are what what you would call expressionist in that they are paintings of people that are designed to capture an emotion from the viewer. In a way it is art that does take some getting used to, and is certainly not of a style that one could attribute to the old masters. Then again these days art seems to have drifted so far away from the skill of the masters that one wonders whether there is actually any skill in it anymore, or at least the creation of it. 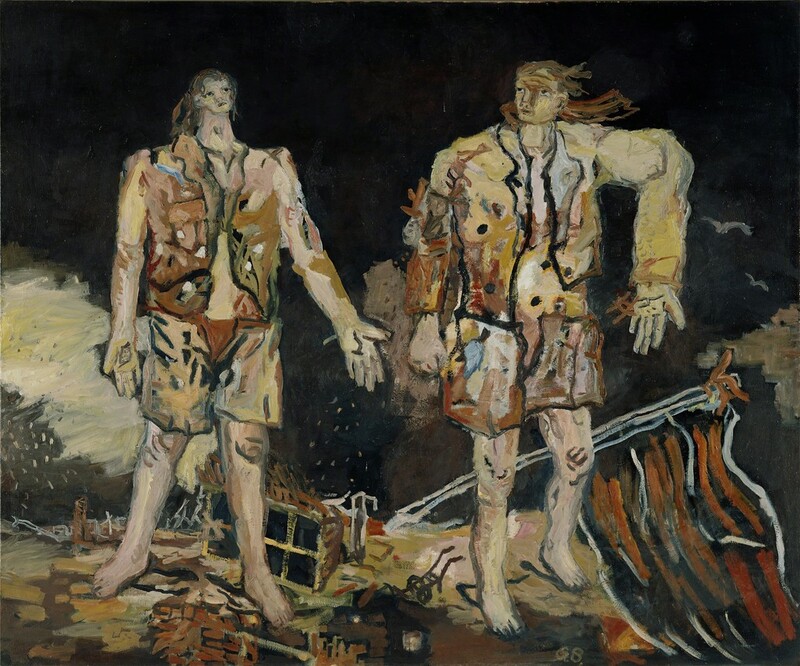 While it is suggested that Baselitz is an expressionist, I could probably also classify him as an existentialist namely because his initial paintings dealt with Germany's existential crisis that came about after the defeat that came from World War II. In fact it almost seemed as if the German State had not only woken up from a really bad dream, but had woken up with a huge hangover and suddenly realised that the the night before was horrendous. Honestly, the whole horrid episode, and Germany's reaction to it, could easily take up a post in and of itself, and it is something that I'm not willing to do since I am neither German, nor had I lived through the sorrid episode. However, Baselitz did - he was born in 1938. As such he not only grew up under Hitler, but he grew up during the war. 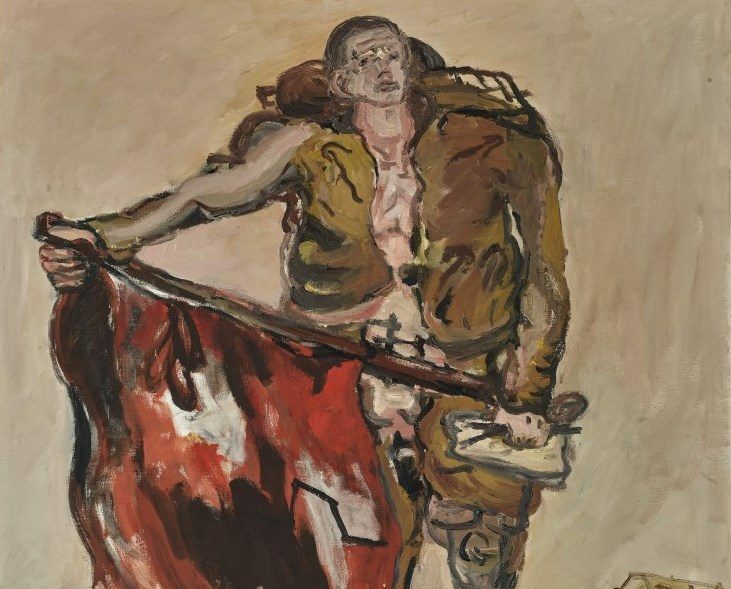 Thus Baselitz not only had known no over government than Hitler's, he had known no other world than a world in which his nation was at war with the rest of the world. It is into this reality that this existential crisis arises - one has grown up knowing only this world, only to discover that not only had this reality been shattered, but that they were also the 'bad guys'. This is was this exhibition was about, Baselitz, and in turn his generation, coming to terms with the reality that everything that had grown up believing was a lie, and that the heroes that they worshiped were little more than monsters. Mind you, this is a change that had been happened throughout Western Europe for a while - the idea of the honourable and noble soldier going out to bravely die for king and country came to a bloody end on the fields of Flanders. In another sense the true horrors of 'my country right or wrong' was revealed in the gas chambers of Auschwitz. I have to be honest here now - when I initially saw Baselitz's works, they didn't make sense. In a way they simply seemed to be nothing more than scribbles that vaguely resembled a human - usually male. However, looking at his background, and thinking about his style, and his themes, these paintings are starting to make a lot more sense. This is one of the beauties of modern art - it has ceased to represent, and reflect, objects, and instead is moving to reflect ideas and emotions. Sometimes I get a little confused with the term Modern Art - usually what comes to mind are those artists, and works of art, that tend to push the boundaries and sometimes simply leave you standing there, scratching your head, and wondering what it is that you actually saw - or experienced. That, however, is more precisely contemporary art, and while some people have a love/hate relation to it, it is something that I will get to shortly since that is the subject of the works in the Staedel's basement. Instead, what we are looking at here are the works of the artists from the 19th and early 20th century. Yet it can still be a bit of a misnomer because the art that appeared during this period took many different forms, and the first we will look at are those from the Romantic movement. Romanticism can be characterised as focusing on individuality and emotion, as well as looking to the beauty of the past as opposed to the present. The interesting thing is that the term has been somewhat corrupted these days to refer to the act of courting (which interestingly arose from the play Romeo and Juliet). However, the true origin of the word is that it pertains to the Roman Empire - hence why we refer to the languages that evolved from Latin as being Romantic Languages. The first work we will consider is called Hamlet and Horatio in the Graveyard by Eugene Delacroix. Delacriox was a French painter and was considered to be at forefront of the movement, at least where paintings were concerned. The focus of this painting, no doubt, is on the fleeting nature of life - which is what the scene in Hamlet is about. Here we have the famous scene where Hamlet looks at the skull of the jester Yorik, and reflects on the past where he was a living, breathing human. In a way not only is life fleeting, but time is fleeting as well. In some cases we will wake up one morning, look around us, and wonder where everything as gone. It turns out that the next work that I'll be looking at is actually a statue. I have to be honest and say that it is difficult doing statues because they tend to be in three dimensions whereas paintings are generally in two dimensions. However, this sculpture grabbed my attention as I was looking through my photos from the Staedel so I might as well write a couple of things about it. 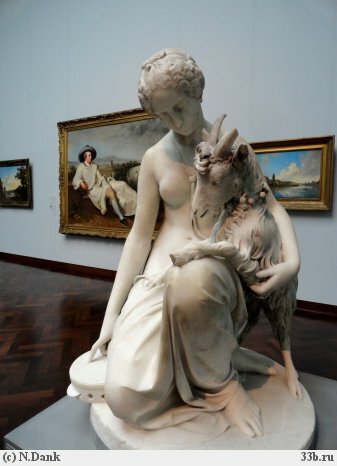 It is called 'Esmeralda and the Goat, Daji' by Antonnio Rosetti, and once again falls into the Romantic category. One of the reasons is that it is based on a character from The Hunchback of Notre Dame. Esmeralda is a gypsy (or more precisely Romani) woman who has mastered the art of seduction. However, she is rarely, if ever, seen without her faithful goat. However, since I haven't read the book I can't say much more beyond that - other than the fact that I quite liked the sculpture. The interesting thing though is that most sculptures that I know of are either of mythical heroes (and villains), or real people - Rosetti has broken with that mould and has created a sculpture from a fictional character. The next painting is of the poet Goethe (who I have written a post on previously). This painting, which is a life sized portrait, was done while he was down in Rome, and it is said that when he saw the painting he made a comment as to how it was simply too big to fit into the average house in Germany. As it turns out, it ended up in the possession of the Rothschilds, who in the late 19th century, gifted it to the Staedel. This painting now hangs in pride of place at the gallery at the entrance to the modern collection. I have to admit that it is actually a pretty impressive painting, and it strikes you as soon as you step into the room. As soon as I saw it I took a photo, and then cropped it and turned it into my Goodreads profile picture. When it comes to art you simply cannot go past Monet. Well, okay, you can, but he is certainly up there with the masters of the impressionist movement. In fact, it was one of his paintings from which the movement got its name, though that was used with scorn as opposed to delight since this movement began to challenge what it meant to be an artist, and what constituted art. 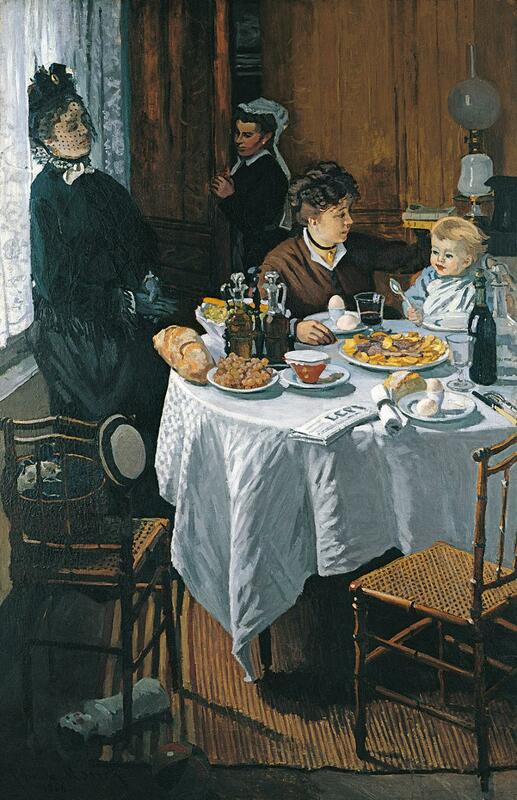 However, this painting, Le dejeuner (Lunch), has a similar impressive back story, since it was the painting that was rejected by the Paris Salon, and in turn gave rise to an alternate, underground, artistic movement. The painting is a simple painting, but then again the impressionists liked to paint ordinary scenes of ordinary people. Okay, I'd hardly consider Monet to be an ordinary person - he is a titan of the artistic world - but I am looking back at his works from over a hundred years. It is similar with Van Gogh, who appeared to have never amounted to much in his life, but has become an artist that is adored my many. 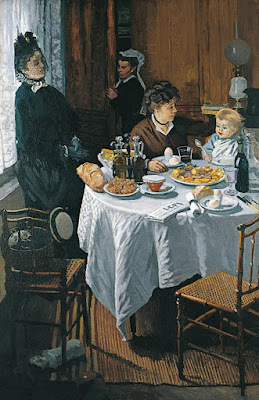 This painting, however, is a simple painting of Monet's family sitting down and eating lunch. In a sense it is simply catching an image of normal people doing normal things, but in doing so it enables us normal people to connect much better with the painting than to the paintings of great and noble heroes. Uhde was a German impressionist who is said to have introduced the style of en plein air into the country. This is a style where the artists works visually as instead of from imagination. It was a style that characterised the works of Van Gogh and other impressionists. Actually, Uhde sat somewhere between realism and impressionism, though a lot of his works, like the great French painters, were of ordinary people doing ordinary things. This painting, called 'A Portrait of a Lady' is actually of Therese Karl. Actually, Uhde wasn't strictly an impressionist, and a painter of real and ordinary things since he also painted religious paintings, such as The Last Supper and The Road to Eumaus. Interestingly, like a lot of other religious artists, Uhde's paintings were painted in a German setting as opposed to a traditional Middle Eastern setting. Like Da Vinci's Last Supper, the fact that they are sitting on chairs is clearly out of place in those paintings. Expressionism is actually a German style of art that arose at the beginning of the 20th Century. The style warped reality to create an emotional impact, usually one related to angst. The style isn't just limited to painting as it also came about in the poetry, and also architecture, literature, theatre, cinema, and dance. Probably the most famous of expressionist painting is Edvard Murch's The Scream. While I could start writing about The Scream, it isn't located in The Staedel but rather in the National Gallery of Norway, so I'll just leave it at that and move onto a couple of the expressionist works in The Staedel. The first that I will look at is a work by Matisse called Flowers and Ceramic Vase. This is a still life, but obviously it isn't anything like the realistic still lifes that many of us are familiar with. This one has some flowers and a vase sitting before an open blue curtain with what looks like a green moon. However, the interesting thing is that the moon is not behind the curtain but before it. Also, while the name of the painting refers to the vase and the flowers, it is interesting that we (or myself at least) seem to be drawn towards the moon - it is out of place, as if invading the scene. While it doesn't necessarily put us out, it certainly seems to be in a place that it shouldn't be. I guess that is the nature of expressionist works. The second expressionist work I wish to consider is a painting called Trumpeters in the Village by Lyonel Feninger. Feninger actually started his artistic career as a cartoonist and worked on comic books. While the Staedel suggested that this background showed in this work, I'm actually not all that convinced. Actually, a part of me wonders why I even picked this painting because now that I have looked at it it certainly doesn't appeal to me all that much. Once again, I guess that is the nature of expressionist works because its rather crude nature suggests a rural atmosphere. Yet the yellow seems to swallow out all of the details, except the faces, which appear to have been drafted in pen. Still, it is a good example of an expressionist work. The basement of the Staedel is dedicated to Contemporary works of art, and they can be a little confusing. However, while contemporary art can be challenging, or simply ignored by people who don't fully appreciate it, by spending a bit of time studying some of these works can be quite rewarding. As such I will look at some of the works in this post (and my next one), and attempt to wrap my head around the oddity of this style (if there actually is one). The first is by the artist Neo Rauch and is called 'You are Losing All This Time of Yours'. The painting is rather odd, and unfortunately I am only going off the photo that I took with my phone since I can't find a duplicate on the internet. However, it is a picture of a train - no doubt a high speed train - with a cut away in the corner where there are two people, one of them who appears to be weeping. I guess this is the nature of our society, but also the human condition - life is fleeting and time flies. Even though we are able to travel at extra-ordinary speeds these days, time never seems to be enough. In a way it can be quite depressing, with so many demands on our time. In a way it can cause us to break down as the character in the painting has done. No matter what we do, we simply do not seem to be able to slow down the rate time moves. Louvre 3 by Thomas Struth challenges the way that art is viewed. Traditionally we have the artwork and us, the viewer, however Struth takes a step back and has us viewing the viewers, as well as viewing the art, and the artwork itself. The work is photographic and is of one of the rooms in the Louvre. Here we have a group of people, all sitting on seats, looking at the various works of art around them. People have always taken photos of art (where allowed), as long as there has been cameras, but this is different - not only are we photographing art we are also photographing those who are looking at the art. In a way, viewing and admiring art has become an artistic expression in itself. Next we move to another photograph, this time at an airport - Charles de Gaulle to be precise. Now, despite having been to France, I haven't been through Charles de Gaulle so I cannot really comment on it. However, what we have here is a photograph, and a rather simple one at that, becoming artistic. In another way it is celebrating architecture. Architecture is a form of art, and many of us don't actually take the opportunity to appreciate it. What Gursky is doing is forcing us to step back and have a look around us, and appreciate the art that is not only on the walls, but are the walls. The next work is called The Mountain King, and is classic contemporary art. Actually, if it wasn't for the explanation on the Staedel website I probably would have dismissed it as simply being pretentious. However, it is an example of how contemporary artists use seemingly innocuous objects to create a meaning. This looks like a couple of rocks, but Beuys is causing us to think of the ancient German tradition of the mountain king. These were ancient kings who live on in the mountains. However, it is also reflective of Plato's cave, of a human who has reached a higher state of consciousness. Mind you, I'm probably not one of those humans because I will simply look at this and think that it is just a couple of rocks. I'll finish of this post with a work from one of my favourite contemporary artists - Andy Warhol. While I have already written a post on an exhibition that I visited here in Melbourne, this was on display at the Staedel. This is not surprising because it is of one of the museums most well known works, which is of one of Germany's greatest writers - Goethe. However, what Warhol is doing here is rejecting the traditional method of creating unique works of art by turning them into silk screen prints, and then mass producing them. In fact he referred to his workshop as his factory, and had staff mass producing his art. Also, by using silk screen techniques, and the bright colours, he is also transforming not only the way we see art, but the way art is produced. However, this isn't the end of my post on The Staedel, since due to there being so many great works of art for me to explore, I have decided to also write a third, and final, post, as well as a post on my travel blog. I rather liked those Baselitz works. Delacroix has long been one of my favorite artists. The Louvre has a number of magnificent large canvases. Hopefully I'll get around to the Louvre sooner rather than later.